G-AsiaPacific was born in the cloud as a Google partner in 2008. Over the years, our consistency in the quality of service and achieving high quotas qualified G-AsiaPacific to be a Premium Partner for Google for Work, which was most recently rebranded as Google Cloud Premium Partner. Our Premium Partner status reflects on our ability and extensive knowledge in the deployment and services of G Suite in the region, particularly in Malaysia. G Suite by Google is not just about email, it’s the whole productivity suite that brings work to life. Collaborate seamlessly across any device through a range of features like Docs, Sheets, Slides and calendar while cutting down on miscommunication with Google Hangouts for text chats and video calls. With the increasing number of employees working from home and on-the-go, it is important that your business keeps up with this mobility trend. 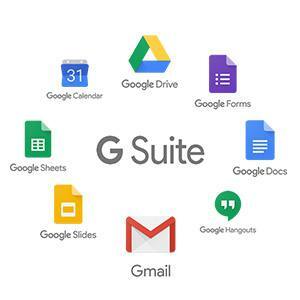 G Suite enables you to work anytime, anywhere on your laptop, tablet or mobile with built-in apps. G-AsiaPacific also provide trainings so your employees will learn how to fully leverage on the mobility working culture. That’s right! With Google Sites you can create your own unique website without any coding or programming knowledge. Start your company blog or website with Google Sites which comes hand-in-hand with G Suite. G Suite’s Hangout feature supports up to 25 participants in one single call. G-AsiaPacific plans your deployment strategy in accordance to your business criteria. Our deployment services and data migration for your email, contacts and calendar are all carried out seamlessly with zero downtime also ensure that there will no loss of data during the process. So call us today to get your cloud transformation project started! Changing existing perception of an entire company can be a daunting process, hence G-AsiaPacific is here to help mitigate those concerns. We provide online or on-site trainings that encourage the adoption of ‘Anytime, Anywhere’ work culture. We also provide information booth on client’s side during our change management process to foster the sense of innovation in the company. G-AsiaPacific provides 24/7 enterprise support so you have a direct point of contact if you encounter any problems or questions regarding G Suite. Our dedicated Google team within G-AsiaPacific is always on standby to support your business within our SLA.